The wreck is said to be very well preserved, with the mud on the seabed keeping it both hidden and protected. “The peculiarity of this is that the wreck could be almost intact," Lt Col Francesco Schilardi of the police divers' group. "We believe it dates to sometime between the 1st Century BC and the 1st Century AD," he added. Study of the vessel should help to understand commercial activity in that era during the early Roman period. The ship is believed to have travelled on trade routes between Spain and central Italy laden with more than 200 clay vessels called amphorae containing fish, wine, oil and grain. 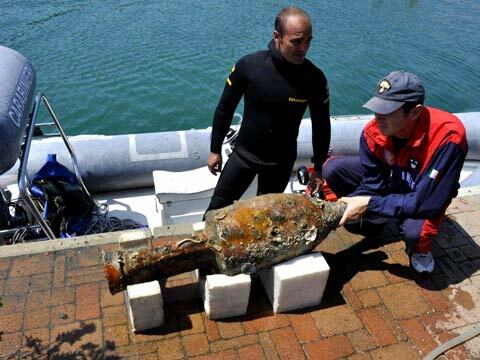 The group of divers who discovered the vessel says it would be technically feasible to raise it. It will now be up to the Italian authorities to decide whether to launch any such complex and expensive operation. For the time being, the area has been secured by Italian authorities, with no fishing or passage of any other boats allowed near it. We believe it dates to sometime between the 1st Century BC and the 1st Century AD.